Dental implants are a wonderful option for tooth replacement, no matter how many pearly whites you have lost. In the case of single tooth replacement, this comprehensive method offers unsurpassed stability and security for the long-haul -- and it can keep your remaining natural teeth sturdy in place as well. Keep reading to learn more about how single-tooth replacement works with a dental implant, and whether or not this option is right for your smile. Dental implants take the place of your missing tooth’s root to provide a natural solution for tooth replacement. A traditional dental implant is made up of three parts: the implant itself, which is surgically placed beneath the gum, a connecting abutment, and the prosthetic tooth that is affixed on top. Sometimes, a single-stage implant may be used, which is made up of just the implant post with the crown that is placed later. 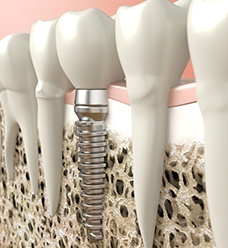 Dental implant procedures take place over the course of between six months to a year. The total length of time depends on how healthy your jaw is to start with, where in the mouth the missing tooth is located, and other factors. How Does a Single-Tooth Implant Function? To replace a single tooth with a dental implant, the post is strategically placed in the space where the supportive root structure once was. After it has healed together with the jaw (a process which will take several months), a sturdy crown is created and then bonded on top of the connecting abutment. 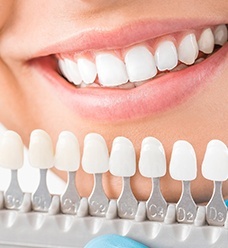 This method does not require the alteration of the surrounding teeth like with a dental bridge. Thanks to the strength of a dental implant, any tooth that surrounds it can stay sturdy, secure, and healthy for a lifetime to come. The cost of your implant procedure will vary based on a few considerations, but the implant itself may cost between $1,000 and $3,500. The only way to know for sure what you should expect to pay for your procedure is to schedule an appointment with our office. When you do, our team will evaluate your jaw bone, the location of the tooth, and consider other factors to give you a very close estimate. Dental insurance usually does not cover dental implants, but patient financing can help you make convenient payments on larger dental bills. No matter the cost of your dental implant, remember that this is a wonderful investment to make in your lasting smile! Nothing else promotes lasting oral health like a comprehensive tooth replacement. 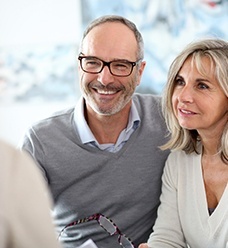 To learn more about dental implants, including whether or not you are a candidate for single-tooth implant replacement, you are invited to contact the office of the Jacksonville Dental Specialists. You deserve to enjoy all the confidence of a complete, beautiful smile!